加藤敦・真木雅之・岩波越・三隅良平・前坂剛. 2009: Xバンドマルチパラメータレーダ情報と気象庁レーダ情報を用いた降水ナウキャスト . 水文・水資源学会誌, 22, 372-385. 真木雅之, 2011: 極端気象に強い都市創りに向けて、環境・エネルギー, 318, 4-6. 真木雅之, 2012: 極端気象に強い都市創り－局地的豪雨の監視とナウキャストは可能か－, 天気, 59, 497-500. 真木雅之・前坂剛・清水慎吾・平野洪賓・Shakti P.C., 2013: ＸバンドＭＰレーダネットワークによる雨と風の三次元分布推進手法の開発,　河川，10月号, 18-25..
American Meteorological Society, 2000: “Glossary of Meteorology”, 855 pp. Browning, K.A. and C.G. Collier, 1989: “Nowcasting of precipitation systems”, Reviews of Geophysics, 27, 345-370. Collier, C.G., 1996: “Applications of weather radar systems: A guide to uses of radar data in meteorology and hydrology”, John Wiley and Sons, 390pp. Fox, N.I. and J.W. Wilson, 2005: “Very short period quantitative precipitation forecasting”, Atmospheric Science Letters, 6, 7-11. Golding, B.W., 1998: “Nimrod: A system for generating automated very short range forecasts”, Meteorological Applications, 5, 1-16. Golding, B.W., 2000: “Quantitative precipitation forecasting in the UK”, J. Hydrology, 239, 286-305. Kim D.-S., M. Maki, S. Shimizu, and D.-I. Lee, 2012: X-band dual-polarization radar observations of precipitation core development and structure in a multi-cellular storm over Zoshigaya, Japan, on August 5, 2008, J. Meteor. Soc. Japan, 90, 701-719. Ligda, M.G., 1953: “The horizontal motion of small precipitation areas as observed by radar”, Technical Report 21, Department of Meteorology, M.I.T., Cambridge Massachusetts, 60pp. Orlanski, I., 1975: A rational subdivision of scales for atmospheric processes, Bull. Amer. Meteor. Soc., 156, 527-530. Satoh, S., T. Ushio, S. Shimamura, K. Maruo, F. Mizutani, M. Wada, H. Hanado, S. Kawamura, S. Uratsuka, and T. Iguchi, 2013: Three-dimensional Fine Structure of Localized Heavy Rainfalls Measured by Phased Array Weather Radar, 36th Conference on Radar Meteorology, 16-20 Sep, 2013 , Breckenridge, Co., https://ams.confex.com/ams/36Radar/webprogram/Paper229080.html. Seed A.W., 2003: “A dynamic and spatial scaling approach to advection extrapolation”, J. Appl. Meteor., 42, 381-388. 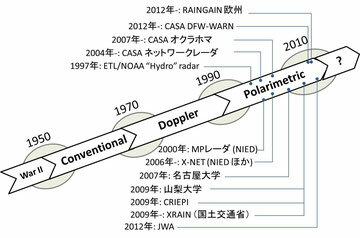 Shoji Y., 2013: Retrieval of Water Vapor Inhomogeneity using the Japanese Nationwide GPS Array and its Potential for Prediction of Convective Precipitation. J. Meteor. Soc. Japan, 91, 43-62. Ushio, T., S. Shimamura, T. Wu, H. Kikuchi, E. Yoshikawa, S. Yoshida, F. Mizutani, M. Wada, S. Satoh, and T. Iguchi, 2013: Observation and initial comparison of the Phased Array Radar at X band, 36th Conference on Radar Meteorology, 16-20 Sep, 2013 , Breckenridge, Co., https://ams.confex.com/ams/36Radar/webprogram/Paper228470.html. Wilson J.W., N.A. Crook, C.K. Mueller, J. Sun, M. Dixon, 1998: “Nowcasting Thunderstorms: A Status Report”, Bull. Amer. Meteor. Soc., 79, 2079-2099.